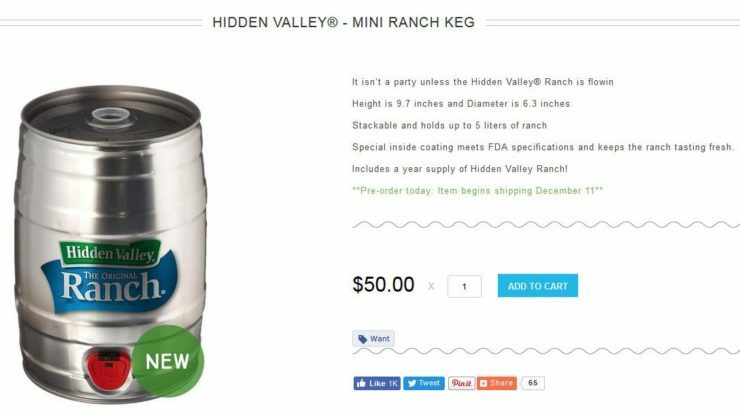 Hidden Valley Releasing A 5-Liter Keg of Their Ranch | OhGizmo! By Randy Donack on 11/09/17 • Leave a comment! Just in time for the holidays, you can get your hands on this 5-liter (that’s 1.3 gallons for real people) keg of Hidden Valley ranch. Yes, it is real, and yes it is a crime against God awesome. Now, you might be thinking that if Hidden Valley was to make an abomination like a 5-liter keg of ranch dressing, they should’ve done so in early summer. You know, try and get in on that BBQ action. But I say there’s no better time to take out the ranch keg then when the oven dings and grandma’s sugar cookies are done. Pass the cookies and milk my way! Now I know what you’re thinking and don’t worry, the Hidden Valley 5-liter mini keg is stackable and has a special coating to sure your ranch doesn’t taste like a metal keg. It’s available now for $50. I know what I want for Christmas!